Warm weather is on the way and that means it’s time to think about patio covers! For maximum enjoyment of the outdoors in Sacramento, CA, Vallejo, CA, or San Ramon, CA, there is nothing that beats a comfortable patio. You can share drinks and good times with friends while enjoying the breeze, or host a party or dinner al fresco. This spring and summer, beat the heat and make your patio nice and shady with patio covers from Screen and Shade Solutions! Our outdoor patio covers block out 80% to 90% of the sun’s damaging UV rays. You can spend more time outdoors enjoying the beautiful California weather without worrying about skin damage or adverse health effects from being in the sunlight for long periods of time. Patio covers can be as simple or as fancy as you want them, to match your Walnut Creek, CA, Benicia, CA, or Danville, CA home’s architecture and your own designer and decorative style. 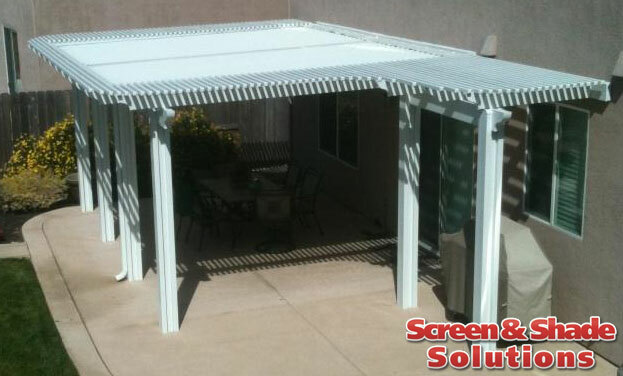 At Screen and Shade solutions, we offer canvas patio covers as well as more permanent wooden patio covers. Lattice patio covers are a popular option, and they give you the option to allow vines to grow up over your lattice overhead. There is something very relaxing about sitting under a canopy of vines and leaves on your patio, and by planting flowering vines such as trumpet vine and wisteria, you can help nature make your patio cover beautiful and colorful as well. Of course, vines do not provide full protection against rain, though they give great shade, so if you want to be sure that you can sit outside without getting rained on, you may prefer to have your patio at least partially covered by a more solid outdoor patio cover. Awnings are another popular option at Screen and Shade Solutions. Awnings are smaller than full patio covers, so that they shade your windows and give you a space to sit out of the rain in front of your door, but do not cover over your entire patio the way patio covers do. At Screen and Shade Solutions, we serve the Fairfield, Stockton, and Roseville areas, as well as many other cities in the Sacramento, CA area. Give us a call today!